Louis Brennan was an Irish-Australian mechanical engineer and the inventor of Brennan's torpedo, the world's first practical guided missile, and the gyroscopic monorail. He was born on Main Street, Castlebar in 1852. A newly developed grave and headstone officially marking the final resting place Louis Brennan, Inventor extraordinaire (Born 1852 Castlebar, Mayo, Ireland - Died Switzerland 1932) is to be unveiled in St Mary's Cemetery, Harrow Road, London. The ceremony will be performed by An Taoiseach Mr Enda Kenny T.D, who will be accompanied by Mayor of Castlebar Cllr. Noreen Heston on Tuesday March 11th 2014. A plaque commemoration the work of Louis Brennan a will be unveiled in the adjoining Oratory and a Memorial service conducted by Monsignor Canon Thomas Egan the Chief Administrator, St Mary's Cemetery will be held. Following the death of at least five of his older siblings as small children during the Irish Famine Years 1842 and 1847, the Brennan family emigrated to start a new life in the gold rush boomtown of Melbourne, Australia. Louis Brennan started his working life as a watchmaker in Australia and went on to become an Irish-Australian mechanical engineer and inventor of Brennan's torpedo, the world's first practical guided missile, and the gyroscopic monorail. "Sir, your invention promises to revolutionise the railway systems of the world'. Over the next three years, Churchill would do his very best to ensure that Brennan's gyroscopic monorail would become the must-have transport system of the 20th century. He did not succeed but nonetheless, with a torpedo and a helicopter also under his belt, Brennan must surely be the most remarkable inventor ever born in Ireland. At the tender age of 22 Brennan invented for coastal defence a torpedo which was propelled by counter-rotating screws driven by the unwinding of two fine steel wires from internal drums and steered by the differential action of the two wires which were wound on to drums on shore or on shipboard by a 28 Horsepower steam engine. Louis Brennan was manager of the Government Torpedo Manufacturing Plant, at Gillingham, Kent, which manufactured his own torpedo, from 1880 to 1896. He took up employment with the Ministry of Munitions from 1910 until 1918, when he moved to the Royal Aircraft factory at Farnborough, where he invented a type of helicopter. However, the withdrawal of funds prevented the invention being made a commercial proposition. 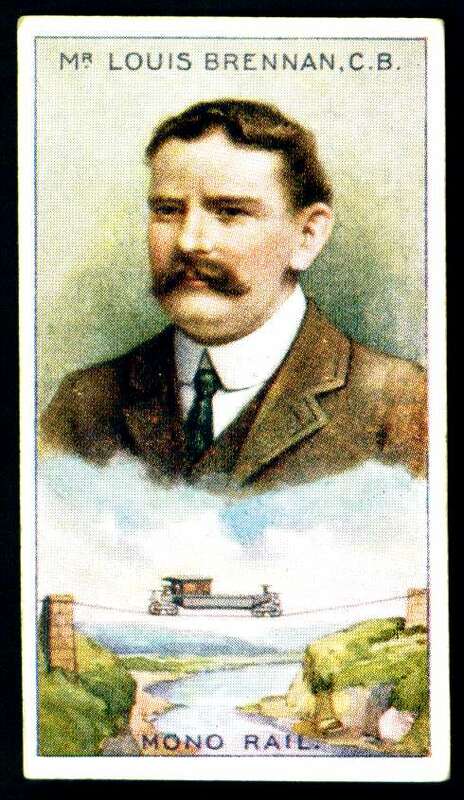 Louis Brennan had at least thirty-eight items patented in London by the time of his death. While on holiday in Montreux, Switzerland, Louis Brennan was knocked down by a car on 26th December 1931, and died as a result of the injuries received on 17th January 1932. He was buried in an unmarked grave in plot. No 2454, St. Mary's Cemetery, Harrow Road London N.W. 10 on 26th January 1932. Following a public meeting held in the Travellers Friend Hotel to arrange for the erection of a memorial to Louis Brennan two years ago, a local committee to arrange for the erection of a suitable memorial to this famous Castlebar born inventor was established. This small and dedicated group, consisting of local historians Brian Hoban and Ernie Sweeney, Michael Baynes, Michael Feeney, M.B.E.& Mayo Person of the Year and Councillor Ger. Deere have worked tirelessly behind the scenes this last two years to ensure this project would reach completion. Now thanks to the sponsorship among members of The Irish Diaspora in England especially retired Manchester businessman Mr John Kennedy, C.B.E., K.St.G, D.L. of Manchester & K.M.C.O., Andy Rogers, John Basquill & Kieran Mc Cormack, London and the support of Castlebar Town Council Louis Brennan will now be given the recognition he richly deserves. Descendants of Louis Brennan from the U.S will join with members of the organising committee from Castlebar and members of Mayo Associations in the U.K. for this historic event. L to R: Cllr Ger Deere, Castlebar Town Council, Cllr. Cyril Bourke, Chairperson M.C.C., An Taoiseach Enda Kenny T.D., Outgoing Irish U.K. Ambassador Mr .Robby Mc Donagh and Andy Rodgers, Mayo Association. It is also hoped that a memorial plaque will be unveiled at his birthplace in Castlebar.